The San Diego city streets are filled buses of all types, including Metropolitan Transit System (MTS) city buses, the North County Breeze (North County Transit District), chartered tour and party buses, and yellow school buses. While most of the time bus drivers and motorists exercise caution and respect each others right of way on the road, not every driver or motorist is so cautious and respectful. This unfortunately leads to accidents, which are becoming too frequent of an occurrence throughout the county. Bus crashes are particularly destructive and potentially devastating due to the large size and weight of buses, which makes them harder to slow down and stop. When a crash happens, it can cause greater destruction and be more devastating than other vehicle collisions. 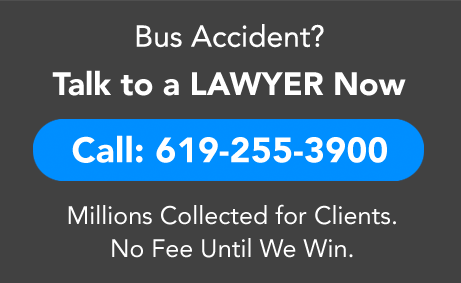 If you or a loved one has been injured in a bus accident in San Diego, you need an experienced bus accident lawyer to protect your rights and help you and your family obtain justice. When you retain the help of Injury Law Group, a San Diego bus accident attorney will immediately make sure that you are receiving proper medical treatment. If you are not being treated, your accident lawyer will promptly refer you to go and see medical providers, so that you can receive the treatment you need and begin to heal and recover. While you are receiving treatment, your attorney will be protecting your legal rights so that you obtain a just result. Your lawyer will be investigating the causes of the crash, so that we can prove who was responsible for your injuries or loss. Bus accidents are causes by both by bus drivers and drivers of other vehicles or trucks. Bus driver caused accidents are usually due to fatigue, negligence, speeding, or carelessness in not paying attention to the roadway, road signs, or other drivers when driving on the roadway. Crashes caused by another car or truck or other motor vehicles are usually due to a vehicle to a motorist either suddenly veering their car or truck in front of a bus and causing a crash, or the car or truck driver cutting off the bus, which attempts to avoid colliding with the vehicle and as a result ends in a collision. Crashes can also be the result of defective maintenance by the bus company or private company contracted to do the maintenance, or as the result of defective parts that were not up to par due to defective workmanship by the manufacturer, such as faulty brakes. In such cases, the company responsible for maintenance of the bus, or the manufacturer of the defective parts, may ultimately be responsible for your family’s injuries or loss. If you have been injured in an accident involving an MTS city bus, the North County Breeze, or a tour bus or school bus, contact us today for help. Our dedicated bus accident lawyers will protect your legal rights and fight hard to obtain justice for you and secure full payment for all of your medical bills and lost wages for time you were unable to go to work. We are expert personal injury attorneys that can help you obtain the maximum financial compensation for your injuries, pain and suffering, lost wages, loss of future earning capacity, and other loss you have had as a result of an accident caused by someone’s carelessness. Call us today at 619-255-3900.